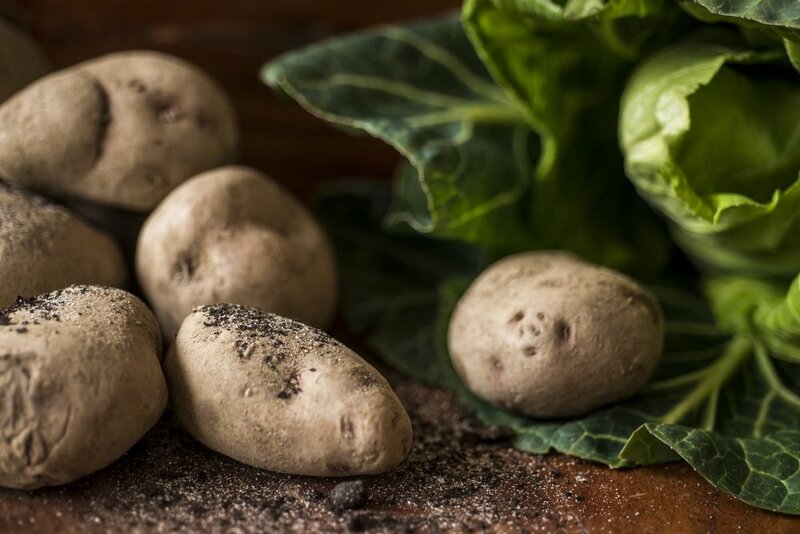 The Irish and their bittersweet love affair with the potato appeared to have started in 1589, courtesy of the Elizabethan adventurer Sir Walter Raleigh, who brought potatoes to Ireland and planted them at his Myrtle Grove estate in Youghal. Initially, many were sceptical about eating them, believing that the tuber was not meant to be food (because it was not mentioned in the Bible) and even that it caused leprosy and encouraged flatulence. Despite these early misgivings, the potato was quickly accepted and became enormously popular. By the early 1700s, nourished by this new superfood, the population of Ireland had doubled to two million and by 1843, grown to nearly nine million. Approximately three million Irish peasants lived off the humble spud; the average adult man consumed twelve pounds to fourteen pounds of potatoes per day. Despite eating mostly potatoes (perhaps with some cabbage, fish, and buttermilk occasionally added to their diet), Irish peasants were quite healthy. Since potatoes contain many vital nutrients—complex carbohydrates, minerals, various vitamins, and some protein—they were certainly more nutritious than bread, which was the staple food of the poor in Europe and England at the time. The potato had no shortage of admirers. In an 1819 issue of The Gentleman’s Magazine, John Nichols wrote of a ‘happy, healthy people, content in their ways’ and Friedrich Engels happily declared that the potato was the equal of iron for its ‘historically revolutionary role’. Sadly, this potato nirvana was not to last. It has been well documented throughout history that dependence on a single subsistence crop frequently ended in disaster, and this once again proved to be the case in Ireland. Crop failure was not unheard of in Ireland, for between 1728 and 1845 there had been at least twenty-four occasions when the potato harvest had failed, and it seemed that it would only be a matter of time until a catastrophe of biblical proportions occurred. It finally happened in 1845: the harvest failed miserably, resulting in what is now known as the Great Hunger (an Gorta Mór in Irish Gaelic). This caused Europe’s worst natural disaster since the scourge of the Black Death at the end of the fourteenth century. The legacy left by the blight: over a million and a half Irish died—to put that in perspective, that’s one out of every eight people. By the middle of the nineteenth century, the potato of choice was a varietal white potato known as the Lumper. It appeared ideally suited for land poor in nutrients, such as in the west of Ireland. All was going well, until the summer of 1845, when the potato harvest was just about to start. A strange smell began to appear, and on closer inspection farmers discovered that all the potatoes had turned into a black slime. This was not just an Irish but also a global catastrophe. Potato crops failed worldwide, but because of Ireland’s total dependence on them, they bore the brunt of the disaster. It was up to British Prime Minister Sir Robert Peel to remedy the situation. When the full extent of the blight was reported to Peel in October 1845, he put together a commission to deliver aid. He also arranged for a secret purchase of cheap Indian corn from the United States and then moved to repeal the Corn Laws—restrictions on the import of foreign grains—which had been a source for debate in Parliament for decades. Landowners in Parliament wanted the tariffs in place so as to keep their agricultural prices high, while the opposing industrialists believed that if grain prices were lower, people would have more money to spend on consumer goods. The debate wore on and the famine worsened, but eventually the Corn Laws were repealed and free trade became the policy, opening other avenues of reform. The reform may have been a good and humane gesture, but the cheap imported American corn appeared to have no immediate effect. This was because the few Irish mills in operation were not able to mill the maize. Because of its yellow colour, and its unpopularity, it became known as ‘Peel’s brimstone’. Life, particularly in the west of Ireland, was getting steadily worse as starvation began to take hold. This sorry state of affairs forced one of the biggest mass emigrations in European history. Between 1845 and 1855, over a million Irish left for the United States. Despite the horrific events that compelled them to emigrate, their love affair with the humble spud did not waver. The Irish and their potatoes had become so interwoven in the collective consciousness that the Boston police force, which had always had a high Irish contingent, became known as the Blue Potatoes. Much was written about the supposed cause of the blight. Letters to The Times postulated on volcanic eruptions, ‘aerial taints’ from outer space, steam locomotives, the evils of alcohol, sulphur matches, and God’s will. The whole thing seemed unstoppable. But cometh the hour, cometh the man. A country clergyman, Rev. Miles Joseph Berkeley of Northamptonshire, was the first to discover the culprit. After the blight was found in potato fields near his home, Berkeley examined samples of the pathogen under his microscope. What he saw was a moisture-thriving fungus, which was later given a scary-sounding name—Phytophthora infestans. 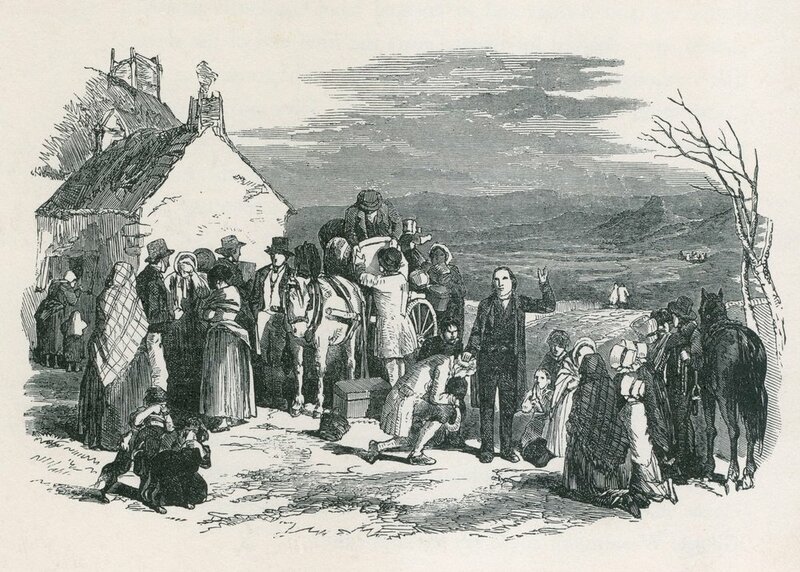 In Connemara, the famine ultimately caused the ruin of the founders of Clifden—the D’Arcy family—and forced hundreds of people, leaving from Clifden Quay, to emigrate to America, England, and Australia. Sadly, many others, who had neither the strength nor the resources to leave, spent their last days in the workhouse. In an effort to mitigate the effects of the famine and ease the suffering of the poor, Quakers set up soup kitchens in the area. Perhaps the most well-known of the Quakers were James and Mary Ellis, who moved from England to Letterfrack and used their resources to help prevent future famine. They leased nearly a thousand acres and reclaimed it for farming, built a schoolhouse, set up a shop for tradesmen, and more. 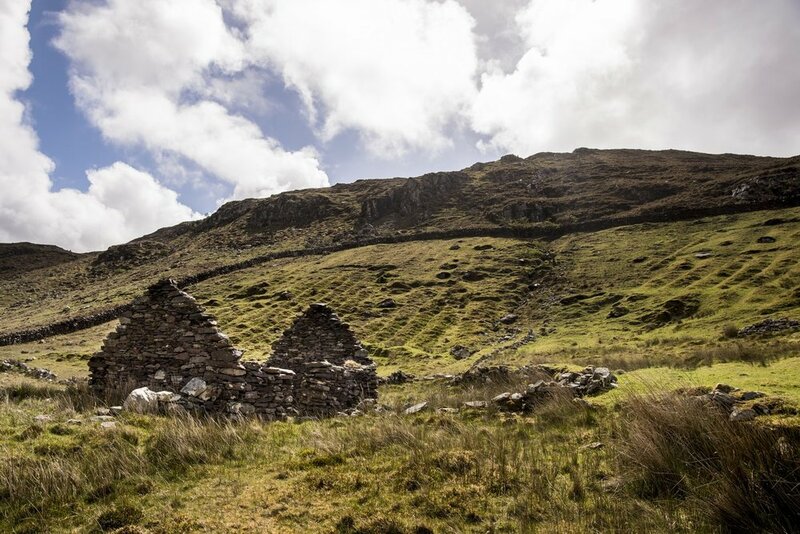 The Great Famine was a watershed that has had lasting effects on Ireland. For both the native Irish and their relations abroad, an Gorta Mór is an indelible part of the nation’s history.